Disney-Marvel's latest blockbuster, Captain Marvel, has powered to the top of the U.S. box office. The movie has taken an estimated $156million from 4,310 North American locations after totaling $61.4million on Friday. The Friday number includes $20.7million from Thursday previews. Should estimates hold, Captain Marvel will rank as the seventh best MCU opening domestically, behind the three Avengers movies, along with Black Panther, Iron Man 3 and Captain America: Civil War. Some insiders are indicating Captain Marvel's debut tally could be slightly more conservative, in the $145million-$155million range. 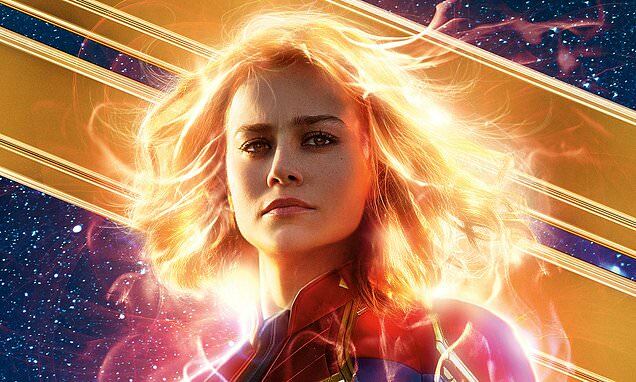 The pic, which stars Brie Larson as Captain Marvel/Carol Danvers, has already taken in $127million internationally, including a $34.3million opening day in China, the second highest MCU opening day in the territory. Samuel L. Jackson, Ben Mendelsohn, Lashana Lynch, Jude Law, Annette Bening, Clark Gregg, and Gemma Chan also star in Captain Marvel, which was written and directed by Anna Boden and Ryan Fleck. Larson stars as Vers, a Kree warrior with a murky past who discovers her history is not quite what she had always believed. It's the first Marvel film to star a female superhero, and has landed an A CinemaScore and 79 percent Rotten Tomatoes score.